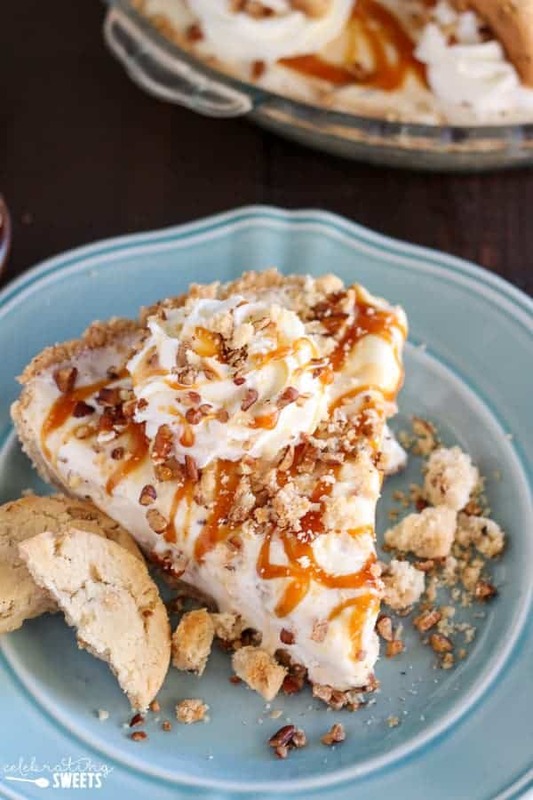 Caramel Butter Pecan Ice Cream Pie – A crushed pecan shortbread cookie crust filled with butter pecan ice cream and topped with caramel sauce, whipped cream, chopped pecans, and pecan shortbread cookies. Summer is almost here! School ends this week and our son Jake will be graduating from preschool. We are not only celebrating the completion of preschool, but the big milestone on our horizon – Kindergarten! We’re kicking off summer the best way we know how: with ice cream! 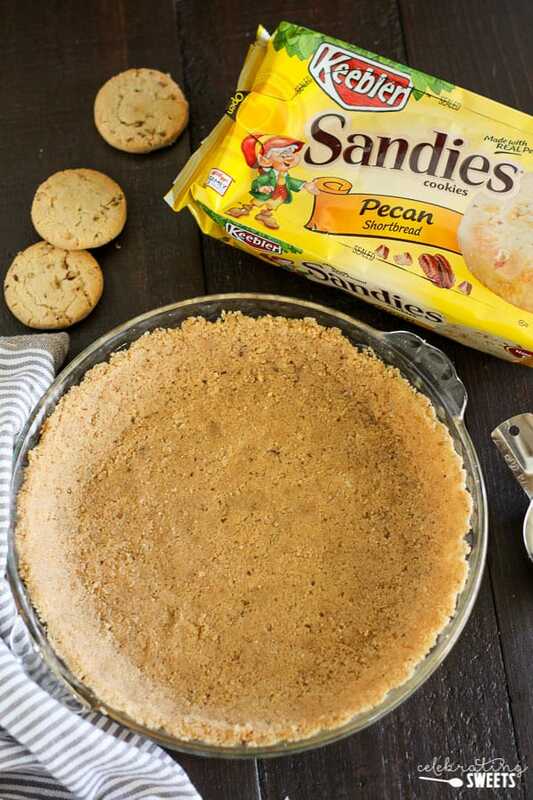 This recipe starts with the crust which is made of crushed Sandies Pecan Shortbread cookies. 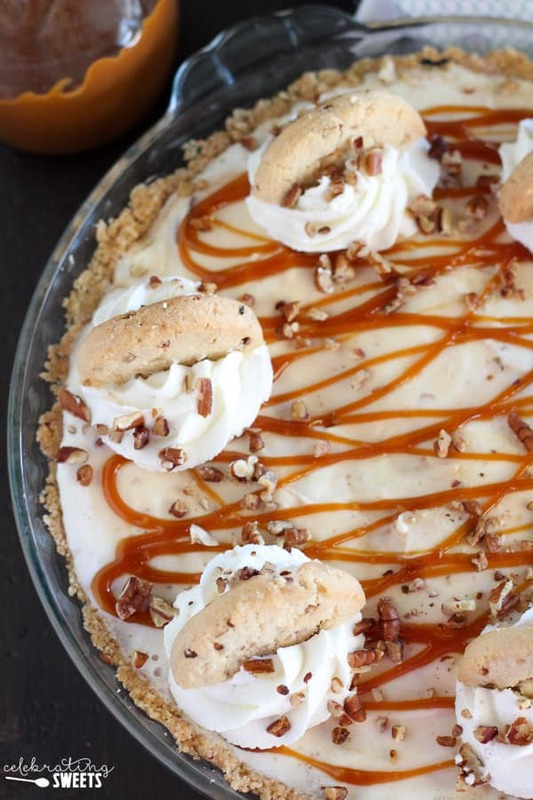 The crust is filled with butter pecan ice cream (I used store bought) and topped with caramel sauce, whipped cream, pecans, and shortbread cookies. It’s SO good! Tell me this isn’t the most delicious way to ring in summer? 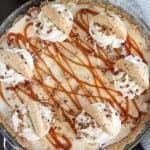 Making this ice cream pie allowed me to take a trip down memory lane. One of the cookies I remember most from my childhood are Sandies Pecan Shortbread Cookies. On Friday nights my grandparents would visit my family, and my parents and grandparents would frequently enjoy Sandies Shortbread cookies along with a cup of coffee while they visited around the kitchen table. 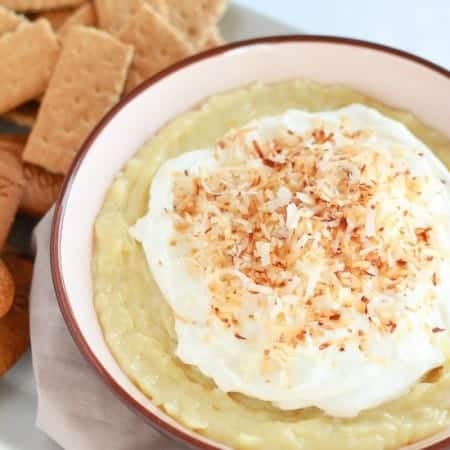 I distinctly remember sitting with them at the table (trying to act adult-like) while stealing sips of their coffee and nibbling bites of the buttery, nutty shortbread cookies. It had been years since I enjoyed Sandies shortbread cookies and I was so excited to dive into a package and revisit those fond memories from my childhood. This time I got to introduce my children to these delicious cookies, as well as the ice cream pie I made with them. They enjoyed them just as much as I did as a child. 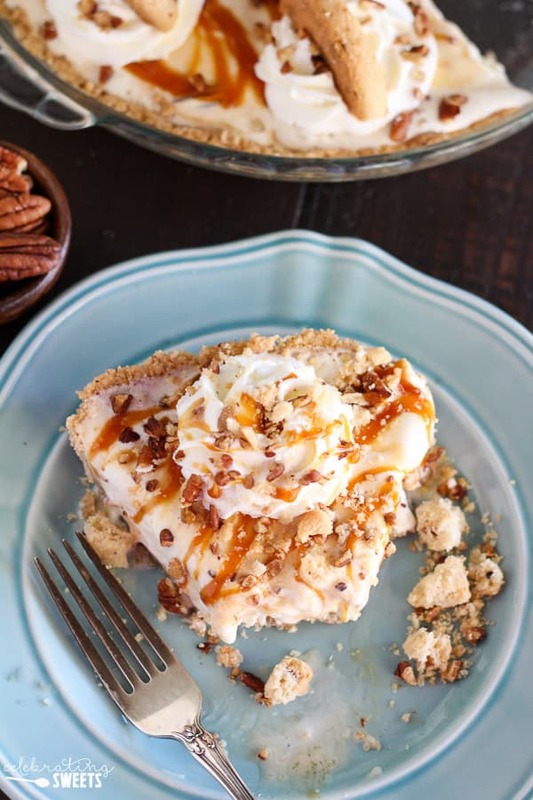 A crushed pecan shortbread cookie crust filled with butter pecan ice cream and topped with caramel sauce, whipped cream, chopped pecans, and pecan shortbread cookies. Preheat oven to 325°F. Place 17 cookies in a food processor and process until broken into fine crumbs (alternately you can crush the cookies in a ziptop bag with a rolling pin). 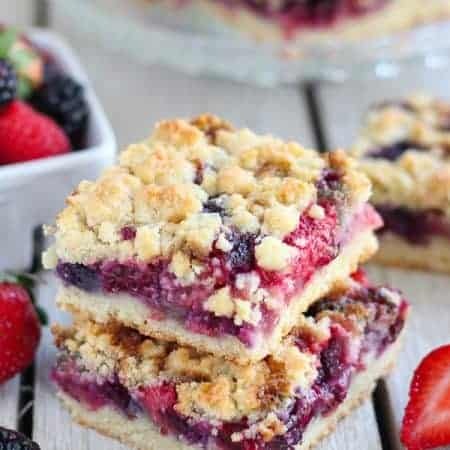 You should have about 1 3/4 cups loosely packed crumbs. If you're a little short, crush a couple more cookies. Combine the cookie crumbs with melted butter. Dump the mixture into a 9 1/2 inch pie dish and press the crumbs into the bottom and halfway up the sides of the pie dish. Bake for 8-10 minutes. Remove from oven and cool completely. 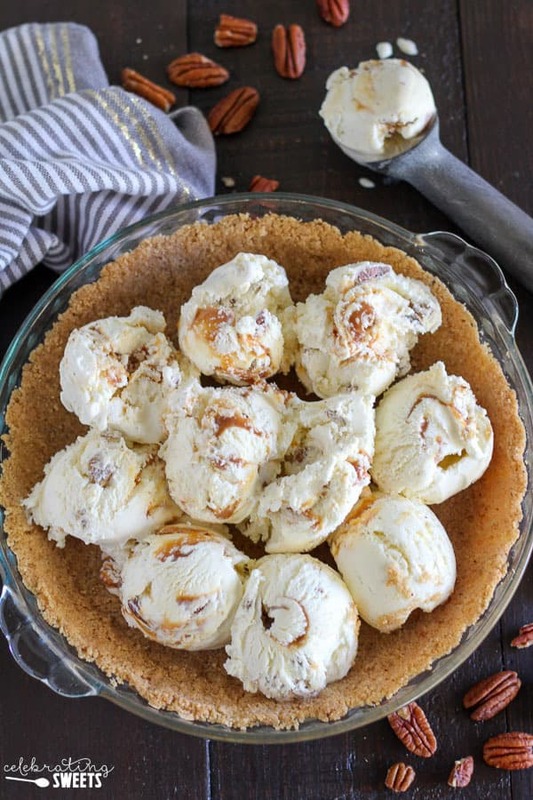 Scoop ice cream into cooled crust and gently spread it into an even layer. Tightly cover and place in the freezer to firm up (at least 5 hours, preferably overnight). Right before serving: whip cream with powdered sugar until soft peaks form. 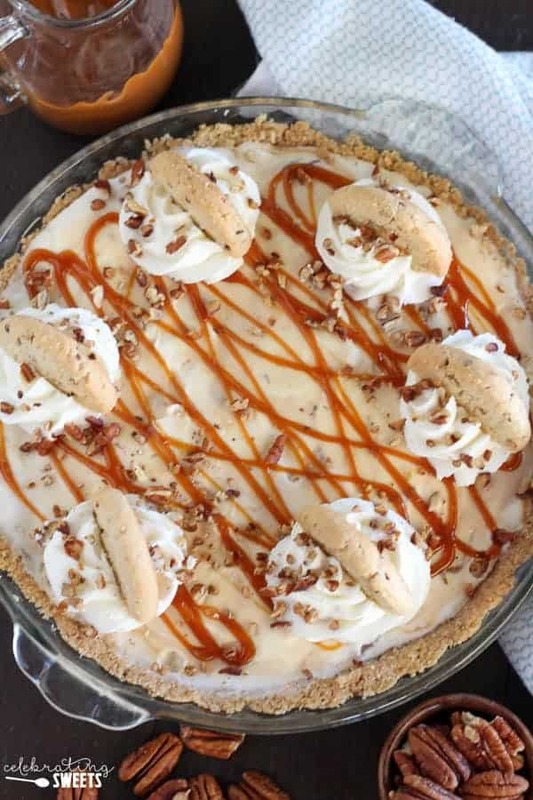 Drizzle the pie with caramel sauce, dollop or pipe whipped cream around the edges, sprinkle with chopped pecans, and place halved or crushed cookies on the top. Serve immediately. I used caramel butter pecan ice cream. The crust is Pecan Sandies?!?! So amazing – great idea! I definitely think my summer needs this! I think I’m crying tears of caramel right now. 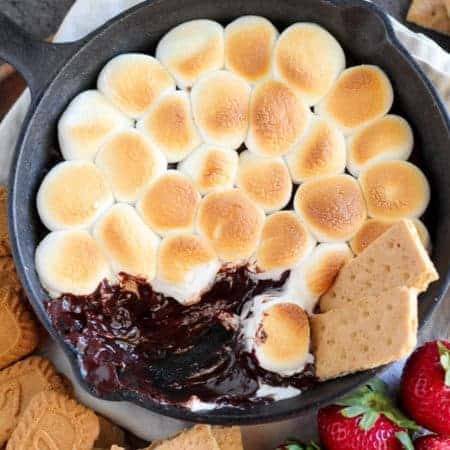 This look AMAZING, and so perfect for topping off warm summer nights. Love!! Ha! You’re hilarious, Karly! 🙂 Wish I could send ya a slice!